OKLAHOMA CITY -- Thunder general manager Sam Presti said he had a "pretty good indication" that Kevin Durant was leaving the team before Durant announced he'd be joining the Golden State Warriors on Monday. "When you do this long enough, I would say this: I would say we have means known and unknown to try to understand and interpret where things probably are headed, and so we had a pretty good indication, I think, that this was a potential outcome," he said. Presti said Durant called him to inform him of his decision before it was posted on The Players' Tribune. "I found out a few minutes before the media," he said. "He called me with his agent and business manager, and we had a conversation. Kevin was great." As for the reasons Durant gave for leaving the franchise he has been with the past nine years, Presti said it was about the "opportunity to pursue a different challenge" and "step outside his comfort zone." "He and I are going to talk, probably down the line," Presti said. "We've worked together for nine years. I have nothing but respect for him. Those obviously aren't easy conversations, but they're necessary, and I'm appreciative that he called me himself." Presti said he has not communicated with Russell Westbrook via phone, but he said they have exchanged text messages, and Westbrook has spoken with other staffers. "I've been attending to other parts of my duties," Presti said, "but I'll talk with Russell and the other guys here, probably either tonight or tomorrow." The Thunder's two meetings with Durant didn't feature any players, while the Warriors, Clippers and Celtics brought players to pitch to Durant. Presti was asked why Westbrook wasn't involved. "How do you know that we didn't?" Presti asked. 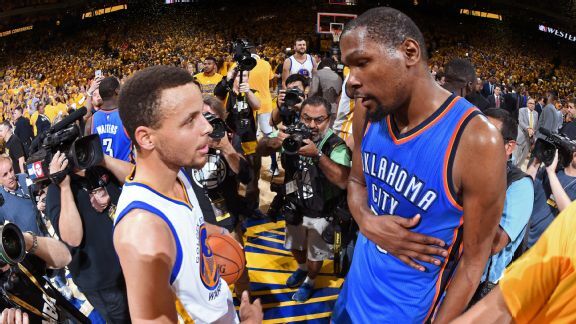 He said Nick Collison and Westbrook met with Durant alone before any of the team meetings started. "I think it's important to give those guys time away from a meeting setting so that they can talk openly and candidly," Presti said. "I talk all the time about those guys being the founding fathers, and those guys, they need to have those conversations that are authentic, and I feel really good that, given the outcome, that they had time together one more time as teammates." ESPN's Brian Windhorst reported Monday after Durant's decision that the Thunder would look to try to negotiate an extension with Westbrook -- who will be an unrestricted free agent next summer -- or possibly explore trade options for him. Presti said he's confident that Westbrook will embrace the new solo leadership role. "Russell Westbrook is a force of nature," he said. "He is a true leader in the sense that he takes it on. He takes it on, and I think he'll take this on as well. He has helped establish the standards that we work by, as have Kevin and the other players that have come before us. But this is a different situation, and I know that Russell will adjust and adapt to that." With Durant now coming off their books, the Thunder can get to the neighborhood of $20 million in cap space, and Presti said the team had contingency plans in place should Durant exit. He said the team won't react quickly but will instead take a few days to process its options. "We'll sit down, we'll look at where we are, and as I said before, like, I think, if you're impulsive, you can be limited," he said. "We don't want to limit ourselves. We want to take a hard look at what's best for the Thunder, and that's always how we've conducted our business."